Oh damn! I didn't even notice. I will add that to the next video. So the D spool before I flip it, has the fishing line wrapped around it clockwise. When I flip it, should I re- wrap the line to make it run clockwise again, or should I just run the motor in the other direction? Thoughts? I think both would work, but I haven't tried either yet. My only concern would be the route the line would take to the rod ring would be different. Just a note, I did get the printer to print in it's current config, but I am interested to see how it does with it flipped. I have been trying different things with the gear flipped over, but it is way to tight. I am not sure how you got it to fit in there. I am printing a new gear to see if that will make a difference. In what way does it get too tight? Do you have a picture? I vote for rewrappring the line. It's where the worm gear meshes with the D gear. Its so tight the motor can't turn it. When you turn it with your fingers it's so tight it will lift the D gear. Did you print the D gear and worm gear in ABS by chance? The shrinkage of the ABS might give you just enough clearance to make it work..
Edited 1 time(s). Last edit at 09/09/2017 11:58AM by brotherchris. I used PLA... Does your gear teeth tilt the right way? I sometimes have similar problems because of the significant elephant-foot I give my prints when squishing down first layers. I fix this by cutting away the elephant foot with a knife. But I usually have room to spare around my worms. Your worm looks really well printed. Hm... Mystery. I have a hypothesis, I printed the frame out of ABS, it probably shrank. The gears are PLA/PETG. I had a PETG frame but I think I tossed it. So I can't compare. Any where close to your measurements? Any problems with the PLA frame getting to hot? Edited 1 time(s). Last edit at 09/09/2017 11:57AM by brotherchris. Well I think ABS is the culprit. I just got a worm gear off the printer. It is 1mm smaller at its largest diameter than PETG/PLA gear. 34.22 mm for ABS 35.24 for PLA/PETG. Oh well, easy fix, just printing the D parts in ABS should solve the issue. I we get it fixed up and report back. This is interesting, I don't have much experience with ABS myself. Never experienced problems with PLA frames getting too hot. If I plan on running motors above 50% of their max current, I use washers as spacers between motor and PLA, just to be safe. 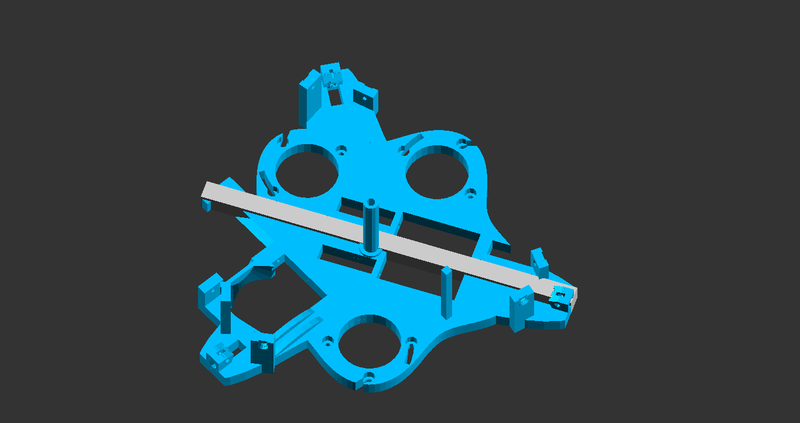 Good to hear, I am back tracking with a PLA frame, I should have it up and running today, fingers crossed everything should fit better. The black is ABS, the silver is PLA. It shrinks just enough to be a problem. Also, I have no clue how to make these photos work correctly from google photos. Edited 2 time(s). Last edit at 09/09/2017 11:53AM by brotherchris. Nice! To post images, do the following but remove spaces within the square brackets. Got url by clicking image to get a larger version, then right click and choose "copy image location"
Finally, I got it to work, thank you. Well man, I am stumped, I have tried PLA PETG ABS, different motors. Different part configs, still can't get the D gear where it is lose enough to move on the worm gear when it is flipped over. Short of scaling down the parts a little, I am out of ideas. I'll keep thinking on it. There has to be something I'm doing wrong somewhere. Edited 1 time(s). Last edit at 09/09/2017 11:59PM by brotherchris. Did a larger bottom plate not help at all? Is the worm stuck all of the time, or is it stuck only at certain positions (parts of the rotation)? I am currently trying to get the most perfect gear print I possibly can to see if that helps. I PLA frame didn't seem to help as much as I hoped. I am trying to tighten up the worm gear as evenly as possible, but I do get tighter parts than other as I roll the worm gear. I have made 2 of the most perfect PLA parts I have ever made. The worm gear and the D gear. It is still way to tight. I am now printing some with a 0.9 extrusion multiplier. I have also ordered some different 608 bearings...who knows. Well it looks like the 608 bearing was off enough to cause the binding. I still think the lower extrusion multiplier helped as did the PLA frame. I think the gears fit well enough for me to continue. Thanks again for the help. Wow, big respect for the grit in debugging this! You found not one but three potential causes of trouble, two of which are completely new to me. Most people would just have given up. Thanks! I also noticed that I've used very fragile code to avoid this bug before (see these five lines of code that I've used to compile stls). Implementing a more robust and automated build process for the stls. Edited 1 time(s). Last edit at 09/13/2017 05:22AM by tobben. Very nice, thanks for making these changes. This should help out others. I'll get some printed and try them out. Edited 1 time(s). Last edit at 09/13/2017 08:03AM by tobben. So I reprinted the gear and tried it out. I think I could make it work on the ABS frame, but still pretty tight. Works well on the PLA frame that was printed with the extrusion multiplier set at .9. I recommend this setting anyway, it makes the screw holes easier to use. Quick update, I got the calibration video done, not my best work, but it isn't easy to setup a Hang printer. Now that it has a more permeate home I should be able to set it up and just let it print. Edited 1 time(s). Last edit at 09/19/2017 02:38PM by brotherchris. There's _lots_ of good work packed into that video. I saw that the calculator gave you a #define ANCHOR_C_X NaN or something I thought: "Bug alert! Somebody, get the one responsible for this! Oh that's me." Did your printer move as expected anyways? What are your thoughts on the v3 and the direction we're taking with current development? Parts for the mover on the right (thanks to Osika) are made such that they can be assembled in any order. Extruder will also be easily detachable. The little sliders (with white tape on the left mover) are the endpoints of lines. Sliding them back and forth makes it very easy to level/rotate printer without needing a screwdriver. So, interesting that you noticed that. I had to move my C mount to 1500mm to get the calc to not say Not A Number. Anything under 1500 would cause this error. I didn't notice it until after the video was done. I didn't try to run it with these numbers, it appears to be moving well now. I thought maybe I had my mounts in such a way that caused an impossible calculation. So no clue what happened. On Hang 3, I haven't had time to wrap my head around it yet. Not sure how the top plate works, so I need to catch up. I will work that in to my reading this week. The part movers look great though. I like the idea of the tabs you can adjust the lines with. I am defiantly on the search for a better way to do my hang2 extruder. That looks like a pretty nice direct drive on that one.